Simon & Schuster won’t be publishing a new Cassandra Clare book this year, but Shadowhunters all over the world can look forward to new covers for Cassie’s The Mortal Instruments and The Infernal Devices! Cassandra Clare’s publisher is repackaging all of the bestselling novels in her massively popular Mortal Instruments and Infernal Devices series. And we at HEA have the first peek at the new cover of City of Bones, which, as you know, was made into a movie in 2013 called The Mortal Instruments: City of Bones. The new cover of City of Bones arrives on Sept. 1. And bonus: Each repackaged book will have a new map and new exclusive content written by Cassandra. 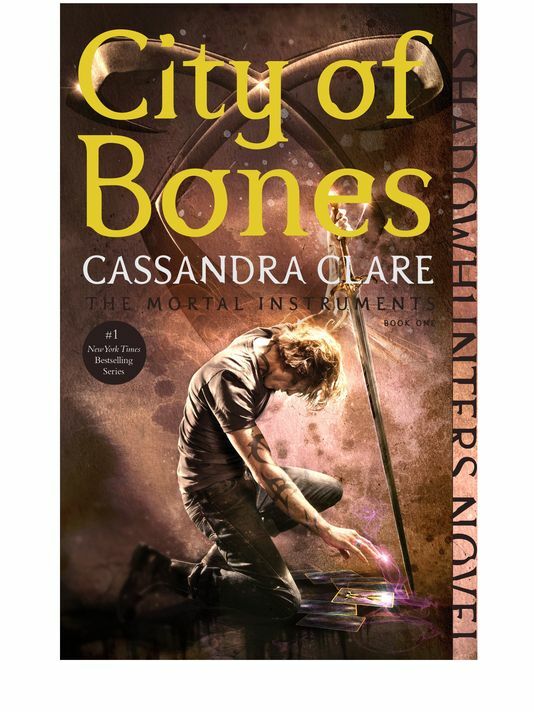 What a great new cover for City of Bones! Jace looks really cool and I am already so excited to find out what Cassie has written for the re-releases! Right now we are not sure if Walker Books, Cassie’s publisher in the UK, will also re-release the books, but we will let you know once we have more information! What do you think of the cover and and which cover are you looking forward to most? Sound off in the comments! I have mixed feelings about this.. I had to reblog this because this new cover is amazing! But why?!?!?!?!?!?! These covers are so bad!!! Why have they done this? I do NOT understand. And The Infernal Devices covers? The ORIGINALS? Are THE most beautiful book covers I have ever seen!!! I actually love this so much!!!!!!!!!!!!! Why do all of the comments here seem to be hating it so much!?!?!? I liked the old ones too but the first one at least looked weird just a picture of Jace’s chest lmao so this one is waaaayyyy better in my opinion!!! It speaks to me more and represents the series in a much better way then the old one and just looks prettier idk idk idk!!!!!!!!!!! i LOVE IT THO!!!!!!!!!!!!!! I can’t wait for the new stuff she wrote too I wonder what that could be?!? Excited for this!!!!!!!!! I am most looking forward to City of Lost Souls!!! That’s my favorite in the series!!!!! I actually liked these covers better… What’d you think? I’m really glad to have all the colorful original covers. If I’d seen the cover above on the shelf in Barnes & Noble, I wouldn’t have looked twice. This design is also tied to the “angel rune,” which was introduced in the City of Bones movie. People who didn’t see the film won’t get it. I wasn’t crazy about that rune anyway. Too angular. My first thought was I glad I have the books,the Oh CRAP! No I don’t have CoLS 😦 But I need it ASAP before I don’t have a complete set of the originals, I have to say I usually want both the old and new covers of books that I love but I’m not a fan of this new one. Cassie said a long time ago that aspects of the covers were building up to the last book. So I assume the sparks coming off his fingers are the sparks from the heavenly fire probably. And the pictures one of them looks like it could be the mortal cup (it’s not big enough for me to be totally sure) so I think they are supposed to be the tarot cards that the cup was hidden in. I think its an awesome, all I can say I’m glad they waited until the series ended to change the covers. It’s so pretty! I love it! Can’t wait to see the rest of them. I guess I’ll put off buying the box set until they’ve all come out…. Looks cool but I’m really irritated that the new books will have extra content!!! What about her loyal fans that already have the books?!?! Not really liking this cover. Like the old covers better. Should have stuck with those. And Alec and Isabelle will each get their own cover as well. Anyone think its a bit strange after all Simon would be best on CoFA not CoG and I love Alec and Isabelle but I really don’t think that they should be on the cover, just them the book won’t exactly be about them. Also I’m sure Simon will already be on the cover of Tales of the Shadowhunter’s Academy when ever that comes out hardcover. I don’t understand why they want to redo the covers. I love the old ones, they are magnificent. That’s what attracted me to these books. The Infernal Devices covers should be left alone, they are really amazing. All of the covers represent each book fantastically. One of the best things about each old covers, is that there is an image of a city that tells us where the events take place, and it goes so well with the titles too. I really really love the old covers. I have a lot to say about this new cover. First of all I would not pick it out from a shelf. I don’t understand their logic, since City of Bones will be made into a tv show, why not wait for it and then change the covers to match the actors from the tv show. This cover looks like they are using components from the movie (Jace, the rune, cards). They already had a different cover for the book when the movie came out. So technically this will be the third version of the cover. This cover is tied in more with the movie than the book series. Second of all, it looks like they just threw stuff on top of each other. The design is horrible. The components don’t go very well with each other. It looks like they put a lot of work into the images, and then they just gave up on the text. For the cover to work the text is important as much as the images, basically they need to coexist together. I know the font is the same as the original, but come on put some effort into making it consistent with the image. The yellow color for the font does not match the cover. Also my eyes go straight to the author’s name and not to the title. In the old cover the title is in white for a reason, because it draws the eyes to the title and then you move to the author. If you look at the old covers “The Mortal Instruments” and “Cassandra Clare” create a border around the tittles, which makes it more prominent. Here in the new cover the text placement doesn’t work. Finally the side bard with the “A Shadowhunters Novel”. Its kind of repetitive, because it already tells you that this is the Mortal Instruments series. The only reason I can thing of why they decided to have a banner is because they want to have it for The Infernal Devices series as well, to connect them. But seriously the banner is not really necessary. Overall to me it looks like the cover is fan made, does not look like a professional made it. I think that they are making a mistake by changing them. Love the way you said all this! Thanks for putting how I felt into words,I agree with everything you said! I LOVE THE ORIGINAL COVERS! Why you gotta mess with something good? If it ain’t broken don’t fix it! I think that the old covers were so much better. Although in the original City of Bones book, the shirtless Jace picture was kind of wierd, but all of the other book covers, with the different characters and the city background and the eye-catching colours looked really nice. It made the mortal Instruments a really beautiful looking series and one that I would want to pick up at random at a bookstore and keep on my shelf. However in the new one, the only thing I think looks nice is the photo of Jace. He looks really good, with the runes, clothes, hair, and sword(is it the mortal sword???). I’m glad they finally got him right! But the strange brown color make the new books totally uninteresting and drab, and the title color, font, and side thing that says shadowhunters is strange and does not look good at all. The new cover is okay, I guess, but I would always prefer the originals. Anyway, I think that anything whatsoever about Shadowhunters is EXCELLENT and I would read it no matter the cover, but I think it would be hard to get new readers interested in them. I didn’t even notice TMI is written there until someone commented on it. At least make the words look nicer please! I really like this! What I loved about the tmi and TID covers was that it hey were original and beautiful. I don’t like the colours chosen for the new cover, I definitely prefer the current covers. THEY CANT CHANGE THE COVERS FOR INFERNAL DEVICES!!!!!! They are changing the covers for the paperback editions, the hardcovers will stay the same. ohhh noooo!!! I love it. I already have the City of Bones original cover book in paperback and hardcover, and I have the City of Bones in the hardcover movie jacket. That’s three copies of City of Bones.. Now I absolutely love this new one they created…I guess I will have to own four copies of City of Bones. When will it end? lol. However, Clockwork Angel has always been my most favorite book cover ever. Not just of the series but of any book ever. I can’t possibly imagine them improving upon it! But we shall see. Ok, not going to lie, love the old covers and books, however, releasing these books again with more and new content as well as new covers is awesome! For those who love the old covers, good, that’s why you have the old books! But I’m glad to have something new to mix in with my collection of old! Really excited for this and this is great for the collectors out there! THANK YOU for not releasing new content with old look!! How come Jace is holding the Mortal Sword and about to pick up he Mortal Cup? It doesn’t make seance! I still like the cover, but just by looking at the first one, I do prefer the old ones.